Well, on the bright side, the Browns beat Pittsburgh this weekend and the Buckeyes beat Michigan. Sure, the (world champion) Miami Heat came back to pull out a close victory over the scrappy Cavaliers in south Florida, but all-in-all, it was a pretty good weekend. The Browns D gets all the love this week. Good results, but far from pretty. Certainly an ugly win is better than an ugly loss, but both football wins weren't the vision of football beauty this weekend. The nailbiter in Columbus was almost singlehandedly delivered by the Ohio State offense, which just couldn't put the Wolverines away despite a great defense effort. The Buckeyes' offense constantly stalled despite short fields, and it wasn't until just over a minute left when Carlos Hyde lunged forward for a final first down that the game was in hand. But that was nothing compared to the Browns-Steelers game in Cleveland Sunday. One might say that the Steelers were severely hamstrung, starting geriatric third-string QB Charlie Batch. But they still bring the #1 ranked defense in the league, and given the Browns' struggles, a lousy game could be predicted. Which is exactly what fans got. The Steelers manage to turn the ball over eight times, and even recovered a few more of their own fumbles. But despite no offense whatsoever, the Steelers still scored two touchdowns, one off a tipped Brandon Weeden pass early in the first quarter, and one immediately after an end zone PI call that gave Pittsburgh 1st and goal from the one. And the Browns' D even stepped up and stuffed the Steelers there, but Chris Rainey bounced outside and scored with one second left in the first half. That, however, was the last time that Pittsburgh scored, as the Browns offense kept Pittsburgh severely in check for the entire game. 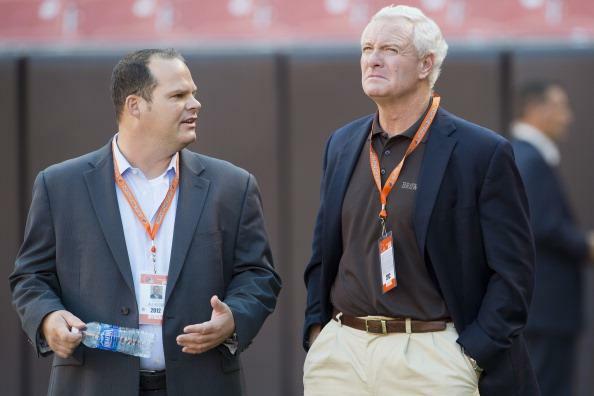 The Browns, likewise, were laughable on offense. Honestly, thinking back, there were three memorable Browns offensive plays this entire game. The first play of the game, where Josh Gordon took a short crossing pattern for a nice gain (unfortunately quickly followed up by Weeden's pick-six), Weeden-to-Cameron for a touchdown after a Steelers fumble (and a short Browns field), and a great Richardson 15-yard touchdown run up the middle (again, after a turnover and a short field). Other than that, it was a disaster. Take the 15 yard TD away from Richardson, and Trent averaged 2.5 yards on 28 carries. Uggh. Weeden averaged a McCoy'ian 6 yards per attempt, and looked clueless trying to go downfield. Speaking of Young Colt, he had to come in and mop up the mess when Weeden left late in the fourth quarter after a shot to the head. This Browns win was delivered on the back of an amped-up, hard-hitting Browns defense taking its frustration out on the shorthanded Steelers. And that defense should have their steaks bought by the ineffective offense this week. I've seriously thought the Browns should win nearly every week, yet they pull defeat from the jaws of victory with unmatched skill. I don't care if Bubby Brister suits up for the Steelers, the Browns, and Pat Shurmur, are cooked. Year after year the Steelers roll into Cleveland, and hand the Browns another loss. Today is no different. At least the horrible idea of giving away white flags to wave has been scrapped. The Browns are a coach away from being competitive in the AFC North and in the league in general. There may finally be a light at the end of this long tunnel of despair, but this team is not reaching it this year. F**** all Pittspuke fans in Northeast Ohio, specifically the ones that latched onto the Stillers because their uncle's girlfriend's sister was Bubby Brister's substitute teacher in 4th grade. Charlie Batch, Charlie Frye, Charlie Brown... doesn't matter who the Steeler QB is... fact is the Steelers find ways to win and the Browns find ways to lose. The Browns finally play a complete game and a pick off Charlie Batch at least twice. I think I may be the last person in Cleveland willing to give Shurmur another year if he can close this season out strong. Ohio State vs. Notre Dame. The game that will never be. A perfect season for Urban Meyer and the Buckeyes, but a shame these Bucks won't be able to see how they stack against the SEC in a bowl game. Ohio State's one-game losing streak against the maize and blue ends today at the 'Shoe. Fans have visions of what could have been and look forward to reloading for '13. A silver-lining-loss if that's even possible against that school up north. I'll sleep well tonight without any "what if" regrets. Too busy watching at the casino to give a witty analysis. Another big Michigan game for Shazier. No matter who you are, I'm hoping you found something to be thankful for this Thanksgiving season. Work developments, a family situation, some personal accomplishment, your team making the playoffs, etc. Well, if you're like me, that last one is so laughable I need to get a towel to clean the coffee off my keyboard. I guess you can be thankful that the powers that be have indeed given Cleveland fans a true Hate Weekend to finish off Thanksgiving week, kicked off by Ohio State vs. that team up north, followed by Cavs and Miami Heat, and punctuated by the Browns vs. mighty Charlie Batch and the Pittsburgh Steelers. While Ohio State has played well enough to coast through their Big Ten schedule, procuring tattoos for merchandise and a lying coach has ensured that today's game against the team in blue is their only bowl game. I don't really know how this Buckeyes team would match up against an SEC powerhouse, but it would be nice to have the chance. 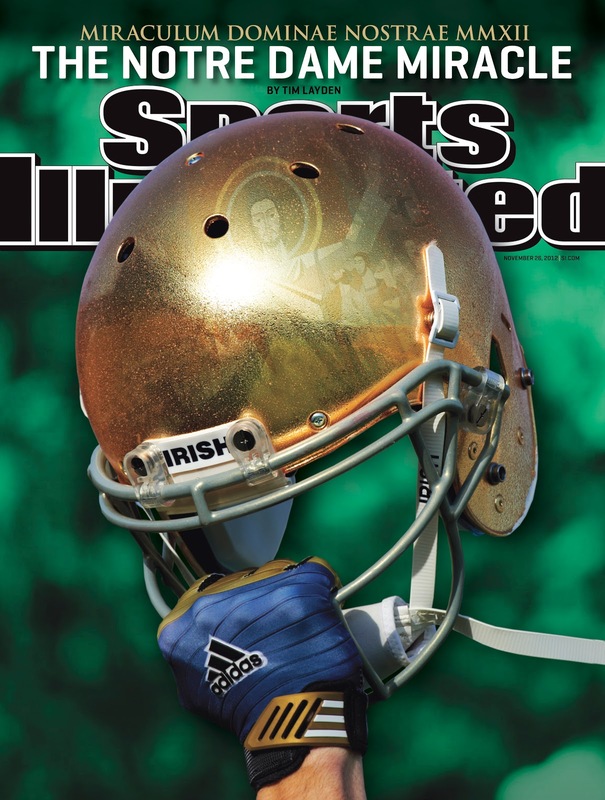 But not nearly as nice as it would be to play the over-shined helmet-wearing Notre Damers. Wow, did social media explode last Saturday when it became apparent they would jump into #1. I'm tired of hearing about them already. "How do you know when someone you're talking to went to Notre Dame? Because they already told you as soon as you met." Although even the Catholic Football Faithful have to be shaken a little bit with this curse-inviting SI cover that I found in my mailbox yesterday. Unfortunately, having an overachieving Ohio State team who is disqualified from any postseason glory is as good as it gets for this fan. The only race that the Cavs and Browns are currently involved in is the race to cover the Mendoza Line. The Cavs, at 3-9 (25%), are not showing the growth expected of them, and it's not going to get any better with Kyrie Irving out for a few weeks. Meanwhile, the Browns are right on the famous line, at 2-8 (20%), a clip that would get you kicked out of first grade. And the way they keep losing is just ridiculous. I mean how many games can they give away at the end? Brandon Weeden has alternated between shaky and solid, and the defense has suffered through missing personnel and boneheaded plays, but at the end of the day, the coaching situation is untenenable. Pat Shurmer Face is haunting me in my sleep right now. Be thankful for all that you can this Hate Weekend. At least we have a team, right? Right? The Browns travel to Dallas on Sunday after what was hopefully a fruitful bye week. 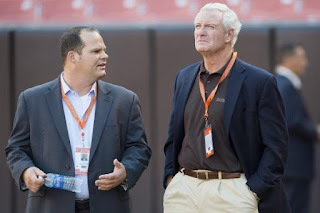 There are still two months left in the season, and before the depressing NFL draft discussion really cranks up as it does in Cleveland around Thanksgiving most every year, what else is there for Browns fans to ponder over the final seven games? Every week the tortured fans here at Cleveland Sports Torture make ill advised picks of the Browns, Buckeyes, Cavaliers, or Indians. But today I thought I'd do something different. 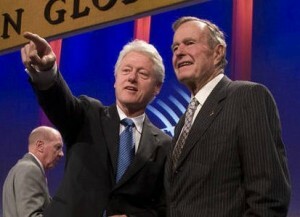 Like make ill-informed predictions for the election. What's that, you say? I guess you probably have missed the election advertising for the past million few months. I guess, then, you might think our predictions mean something! Note, this is a PREDICTION, not necessarily a PREFERENCE. But judge for yourself. The Republican party has tried to blame Barack Obama for everything (a) that they left for him and that (b) they wouldn't let him fix since their Day One goal of getting him out of office. Surprisingly enough, their Ever Incompetent Extreme Ideological Obstructionist (E-I-E-I-O) policy didn't work, despite the way too slow road back from recession and partisanship shown by the President. In other news, should Josh Mandel win this election, I fully expect to see him running for Prez come 2020.